The ability to securely deliver PINs to cardholders while reducing the cost of delivery is a priority for every card issuer and financial service provider. Sending PINs through traditional mail is costly, time consuming, and more importantly, highly insecure. In this month’s edition of eBilling Insight, we explore the Striata ePIN – a secure, stand-alone PIN distribution system that safeguards the PIN from generation to distribution, ensuring that only the customer has access to it. 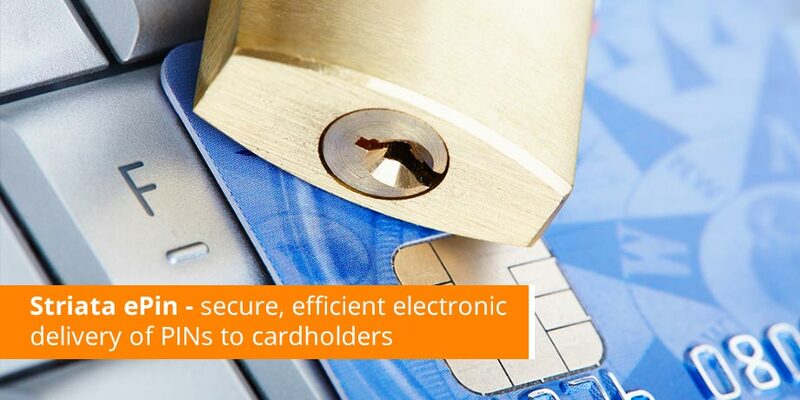 The Striata ePIN solution uses the same technology and functionality as Striata’s secure email document delivery solution – providing financial institutions and other card issuers with secure, efficient electronic delivery of the PIN. This is becoming an increasingly important requirement as card suppliers compete to provide exceptional customer service. New cards and forgotten PINs result in high volumes of PIN mailers being sent through the mail to customers daily. Security is at the core of all PIN based transactions. While cardholders must be cognizant of keeping their PIN a secret, the matter of PIN privacy originates with the card issuer. Striata ePIN meets the global PIN distribution requirements issued by VISA, by ensuring the security and privacy of the PIN throughout the delivery process. This is achieved for both the request and delivery of the PIN, via multiple channels and varying security levels.